Cravings. Urges. Irresistible pulls towards the sweet stuff, the carb-y stuff, the comfort stuff. This is collectively referred to as your “Sugar Dragon” in the Whole30 text; that fire-breathing beast clinging to your back, roaring loudly in your ear, demanding its next fix. 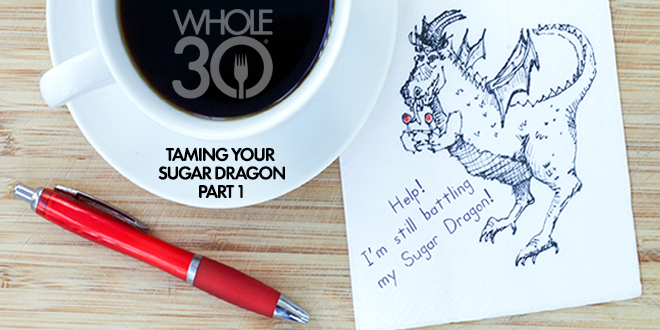 We say the only way to slay the Sugar Dragon is to starve it, which is why the Whole30 rules are so strict. No added sugar, not even the natural stuff. No artificial sweeteners designed to fool your brain. No Paleo-fied pancakes, cookies, or ice cream, because your Sugar Dragon is just as happy with almond-flour brownies as the real deal. Starve your Dragon, and come out on the other end with a tame little gecko, feeling in control of the food you eat for the first time in a long time. After your Whole30, we teach you to ride your own bike*, making decisions about food and treats for yourself in the real world.. But while our system works incredibly well to help you turn what you learned during the program into life-long, healthy habits, inevitably, we all stumble. At some point, thanks to a vacation, holiday, special event, stressful situation, or maybe just because it’s Friday, you’ll wake your Sugar Dragon. You’ll start feeding him again, and like a Gremlin after midnight, he’ll grow faster and stronger than you feel prepared to handle. One day, you may just find yourself right back where you started, feeling out of control with your food choices, a slave to the cravings. In this two-part series, we’re going to talk about the one principle that will help you stay on a healthy track better than any other, some techniques for battling sugary implses, common Sugar Dragon triggers, and how to create a plan to keep your Sugar Dragon under control once and for all. (Now would also be a good time to go back to Chapter 20 in It Starts With Food and remind yourself that this post-Whole30 struggle is normal and expected, so please let’s not beat yourself up about it, m’kay?). The first step in this whole process is awareness. If you simply commit to one principle in Life After your Whole30, you’ll find it’s fully 89% easier to stay in control of your food. Ready? Everything I eat will be the product of a conscious, deliberate decision. That means no automatic eating. No saying “yes” before your brain has a chance to process whether or not you really want it. No pushing conscious thought aside in favor of the rush of excitement. No impulsively giving into the moment: YOLO, donuts on the break room counter! Whatever path you follow, you’re committing to thinking about your food choices, consciously deciding to indulge or pass, and then, if you choose to indulge, mindfully and purposefully savoring your treat, getting as much satisfaction out of the experience as possible with no guilt or remorse, because you were in control the whole time. If you follow through with making a conscious, deliberate decision every time you are presented with an opportunity to either feed or deny your Sugar Dragon, we guarantee you’ll pass on most opportunities—the stuff that isn’t worth it, isn’t special, or just isn’t what you want right now because you just feel so good doing what you’ve been doing. And for those treats you choose to enjoy, you’ll find you savor it more, feel better about indulging, and remain self-confident and in control during and after the experience. There’s one problem with this scenario, however: easier said than done. Let’s talk about what happens when you’re faced with a less healthy food choice, something sweet, salty, and fatty (because no one struggles with cravings for grilled chicken or steamed broccoli). You see donuts on the break room counter, chocolate cake on the dessert menu, or the chips and salsa sitting in the middle of the table. Your brain recognizes an opportunity for reward, and releases dopamine, a neurotransmitter responsible for your motivation to pursue a specific rewarding behavior. Dopamine does not provide happiness, only the promise of happiness. And when dopamine has your attention, you become fixated on that reward. To keep things simple, you can think of dopamine as your Sugar Dragon, breathing fire and insisting you do as you’re told while promising delicious bliss and immediate satisfaction. The same dopamine release also triggers the release of stress hormones (a fire-breathing Dragon on your back is quite stressful! ), which is why you feel anxious and slightly out of control thinking about your treat. Am I going to eat it? Should I eat it? Can I have it now? Should I save it for later? And as we all know, the act of actually eating the treat is often nowhere near as pleasurable as the anticipation you felt just thinking about it. As willpower and stress expert Dr. Kelly McGonigal puts it, “The promise of reward is so powerful that we continue to pursue things that don’t make us happy, and consume things that bring us more misery than satisfaction.” Thanks, dopamine. We talked about this in detail in Chapter 4 of It Starts With Food, but for the purposes of this article, and teaching you how to make conscious, deliberate decisions while dopamine screams in your brain, let’s focus on the stress response. Understand first that stress is the enemy of willpower. These two states are inherently incompatible! In the natural world, stress signifies an immediate threat, like being chased by a predator. Under stress, your fight-or-flight response encourages you to act instinctively, focusing on immediate short-term goals (escape the lion). This response steals resources from your pause-and-plan system (and your pre-frontal cortex, or “willpower center,”) and renders you less capable of wise decision-making. To put it simply, willpower requires you to keep your eye on your long-term goals, but stress makes you think only about what’s right in front of your face. So, with the release of stress hormones when faced with a desirable treat comes a minor version of the fight-or-flight response, a depletion of willpower, and an urge to act on instinct and obtain immediate satisfaction. All of which makes it really hard to make a conscious, deliberate decision to eat (or not eat) that treat. However, there are techniques you can employ to combat this effect, and train yourself to pause-and-plan instead of grab-and-eat. This one is so simple, and yet so effective. When we’re in that fight-or-flight response, our breathing changes—it becomes more shallow, faster, and takes place higher up in the chest. By changing our breathing pattern, we can send a signal to our nervous system that we’re not stressed and all is well, helping to active the prefrontal cortex (“willpower center”) and feel more in control. Temptation overwhelms our prefrontal cortex the most when the reward is available now and you’re looking right at it. To combat this effect, first do your breathing exercises, then create distance—temporal and physical. First, institute a 15 minute, one hour, or one day rule; whatever feels appropriate. (Melissa Hartwig talked about this on her Instagram feed last week.) Tell yourself you’re not going to eat it now, but if you still really want it 15 minutes from now (or an hour from now, or tomorrow), you’ll have it. This gives your brain the space it needs to evaluate whether you really want it, or if it will really be worth it. Then, if possible, remove yourself from the temptation. Close the dessert menu, leave the break room, or move the chips and salsa out of your immediate reach. Out of sight, out of mind, and between your breathing exercises and waiting game, you’ll be in a far better place to soundly evaluate this decision. Finally, if you do choose to indulge, eat carefully and with awareness. Don’t allow yourself to get distracted while you’re eating, don’t eat too fast, and actually taste what you’re eating. Force your brain to reconcile what you thought you’d get out of the experience with what you’re actually getting. Was the idea of it amazing, but it’s not really tasting that great? Did you think you’d be so happy when you ate it, but halfway through, you just feel more anxious and disappointed? Were you expecting it to taste amazing, and if you’re being honest, it’s only so-so? By identifying the disparity between the reward promised and the actual experience, you can take some of the magical appeal out of the treat the next time it appears. We’ve committed to one key principle (make conscious, deliberate decisions) and identified three ways to practice that behavior in our everyday lives. But at some point, inevitably, you will probably still find yourself mindlessly hoovering your third treat in a row, feeling out of control and wondering how you ended up with powdered sugar down the front of your shirt. Melissa Hartwig is a Certified Sports Nutritionist, and the author of the New York Times bestselling book It Starts With Food and The Whole30: The 30-Day Guide to Total Health and Food Freedom. She has been featured in the Wall Street Journal, Details, Outside, Redbook, and Shape as the co-founder of Whole9 and the Whole30 program. Melissa lives in Salt Lake City, UT.